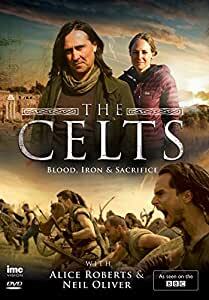 Amazon's Choice for "the celts"
Anthropologist Prof. Alice Roberts and archaeologist Neil Oliver go in search of The Celts - one of the world's most mysterious ancient people. In Britain and Ireland we are never far from our Celtic past but in this series Neil and Alice travel much further afield, discovering the origins and beliefs of these iron-age people in artifacts and human remains right across Europe, from Turkey to Portugal. What emerges is not a wild people on the western fringes of Europe, but a highly sophisticated tribal culture that influenced vast areas of the ancient world - and even Rome. Rich with vivid drama reconstruction we create this pivotal time, and meet some of our most famous ancient leaders... from Queen Boudicca to Julius Caesar, and the battles they fought for the heart and soul of Europe. Alice and Neil discover that these key battles between the Celts and the Romans over the best part of 500 years was a fight for two very different forms of civilisation; a fight that came to define the world we live in today. In the first episode, we see the origins of the Celts in the Alps of Central Europe, and relive the moment of first contact with the Romans in a pitched battle just north of Rome - a battle that the Celts won and left the Imperial City devastated. In episode two, we discover the Golden Age of the La Tene Celtic warrior and reveal how their world extended as far as Central Turkey. But by the middle of the first Century BC the Celts were under threat from an expanding Roman Empire, and the Gallic warrior Vercingetorix would challenge Julius Caesar in an epic battle that would shape the future of Europe. In Episode three the Roman Army turns its attention to an island of rich resources, powerful tribes and druids, and advanced military equipment Britain. We tell the story of the Celts last stand against the Roman Army a revolt led by another great leader, the warrior Queen... Boudicca. The series will use lavish and Immersive CGI to re-build their homes, forts, and entire towns and massive scale dramatic reconstructions. 5.0 out of 5 starsTwo experts, for the price of one. Another BBC History classic, from two brilliant presenters; who take you by the hand and tell you a story. 5.0 out of 5 starsThe story of the Celts! I am very intressed in the story-life and how the lived-and here I var so fond of how Alice Robert & Neil Oliver is telling this story that caught my interess some years ago. All details was a great knowlegde that I beeen searchen for since years and here I was illuminated! I can recomend this for all People that have interesst in the Celts! A very well prepared and presented series.Both presenters are 1st rate and I enjoyed overlap and interchange between them. Bought it as a present they loved it, very pleased.